The ANC3 Large Briefcase-Style Instrument Bag is our top of the line instrument case. Combined with our modularly expandable instruments and accessories, the ANC3 can haul a service truck full of tools to your job, over your shoulder. It has 14 pockets in all. It holds most any combination of your Fieldpiece gear: 3 meters and 10 accessory head instruments with room for plenty more, or, put in 6 standalones and their accessories, 2 meters and more. The combinations are almost endless. One thing’s for sure, you can fit the test instruments you need to do the whole job easier, better and faster with the ANC3 over your shoulder. Features include rugged nylon construction, padding, durable pockets inside and out, a rugged zippers and a shoulder strap. 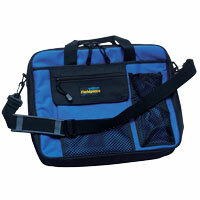 Comes standard with our big Fieldpacks and doubles as a great laptop briefcase. 63 TruReward$ points will be placed in your account when you buy this item.